RAICO THERM+ is a stick-based, thermally-broken, and fully insulated curtain wall system. RAICO’s large product range offers virtually unlimited options to enable unique design solutions for your project. It is available in Aluminium (THERM+ A-I), Timber (THERM+ H-I), or Steel (THERM+ S-I). Also available are the FRAME+ (doors) and WING+ (windows) systems, which provides solutions for the operable elements in your facade. The THERM+ and FRAME+ systems are, of course, fully integratable in a vairety of combinations, allowing you limitless design possibilities. The RAICO systems can also be integrated with our Döpfner Windows & Doors and HAHN louvres ranges. The system does not rely on silicone sealant for waterproofing. Available on roof slopes as low as 2 degrees. Integrates with Döpfner Windows & Doors and HAHN Louvres. The visual appeal of timber, as well as its renewable origins and low embodied-energy content, has always made it a popular choice for both designers and consumers alike. Now, advancements in the glue-laminated timber (glulam) industry have brought large timber curtain walls into the spotlight. These engineered timber products are dimensionally stable and won’t warp like solid timber does. The H-I system is available in long profiles (up to 16m stock length), and depending on the choice of timber, can rival the strength of aluminium or steel. The Therm+HI system includes timber connectors for the mullion and transom joints that are totally concealed and capable of glass loads of up to 481kg (as well as engineered solutions that can cater for up to 600kg). The timber connector design enables simple fabrication and quick assembly. The rebated groove at each end of the transom, and drilled holes to both the mullion and transom, are all made simple with drilling and routering jigs. The timber profiles can be sourced from any supplier, however LAROS Technologies provide sustainably-sourced glulam timbers in European Larch, Spruce or Oak, in virtually any dimensions. Base layer: penetrates the timber and protects against rot and discolouration. Intermediate layer: builds a transparent UV-protective film which does not obscure the natural timber texture. Outer layer: weather-proof surface shield. Also available is Baubuche by Pollimier, which is a tightly laminated Beech timber. With clever engineering, and a massive GL65 rating, Baubuche offers a strength which is unparalleled by other glulam timbers, and can easily be designed to support the structural loads of the building. A number of timber connection options are available, allowing quick assembly of fully concealed joints. The intersecting pieces simply slide into place, as shown below. 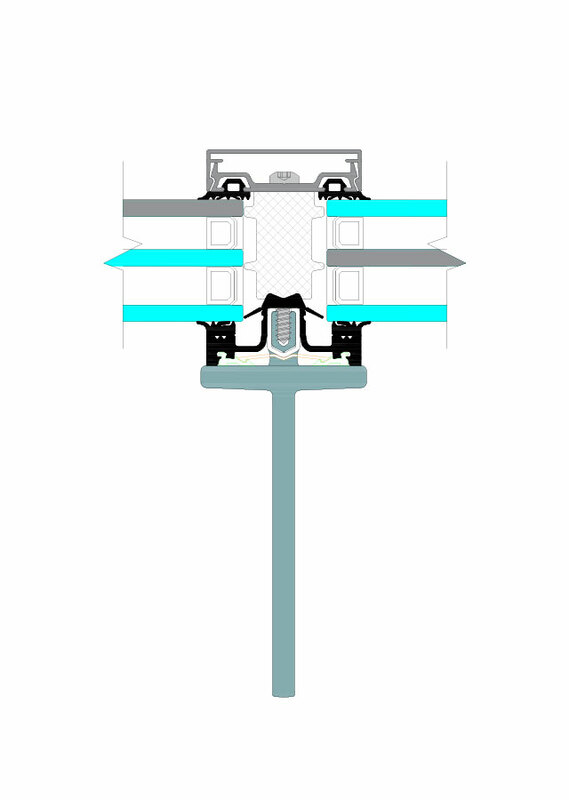 With three profiles to choose from (box profile, expansion profile and T-shaped profile, pictured below), the aluminium series allows the greatest flexibility of design. Internal-stiffener profiles can also be incorporated, for situations where the curtain wall needs to meet high structural demands, or simply to keep the system’s framing sizes to a minimum. The aluminium range is designed with simple manufacturing and assembly in mind. Take advantage of the strength of steel to create visually light frames for curtain walls or design structural steel to have a dual function where it carries the loads of the building and acts as the curtain wall framing. The versatile Therm+ SI curtain wall system makes it possible to choose any standard steel profiles from 50mm wide and up or choose from the slim and elegant range of RAICO steel T-shaped profiles. The screw channel can be either screw fixed, Hilti shot, or welded with specialised jigs for simple fabrication and a high degree of accuracy. RAICO also offers a wide range of windows, doors, skylights, and other operable elements that are fully integratable with THERM+ curtain wall systems. The system capping plates are powder-coated, anodised, and feature RAICO’s innovative THERMORIT technology, for improved thermal properties over conventional polyamides. The FRAME+ door system offers reliable protection against driving rain and draught, reducing expensive heat losses. The low door profile also ensures comfortable, barrier-free access. Modern Style: softer edges with curved contours. Classic Style: distinguished lines with bevelled contours. All design variations are compatible in any combination. Gaskets available in both black and grey. From expressive linear compositions to soft flowing shapes, the FRAME+ system offers unlimited creative possibilities, whilst achieving high-performance technical requirements. The RAICO systems can be seamlessly installed alongside our Döpfner Windows & Doors and HAHN Louvres ranges. LAROS Technologies have already completed a number of successful projects which incorporate all three fenestration systems.